LEEDS UNITED are confident of finalising a deal to sign Motherwell’s Lee Erwin on a three-year contract when the striker returns from holiday later this month. The 21-year-old has just finished his seasonal commitments with the Steelmen and has jetted off for a short break to the USA after helping the Lanarkshire club retain their place in the Scottish Premier League. Erwin, one of three players sent off in a combustive play-off second leg clash with Rangers on Sunday – which saw him and Gers defender Bilal Mohsni involved in an ugly fracas – will be out of contract at the end of June, and Motherwell have tabled a fresh offer. 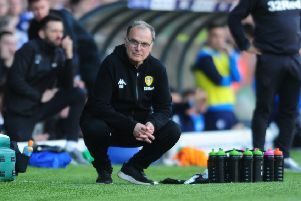 The Scottish club are entitled to compensation for Erwin, but Leeds believe they will land the tall striker for a six-figure development fee, although a figure has yet to be agreed. Erwin’s representatives spoke with United owner Massimo Cellino last week and Leeds are confident that they will land their man. Celtic have also been linked with 6ft 2ins forward Erwin, who hit six goals last season. Ipswich Town and Sheffield United have also been credited with interest in the player. The Glasgow-born striker, a former Scotland U19 player, impressed in the latter stages of last season at Fir Park and made an impact with five goals in his final nine outings. United’s immediate priority is finalising their backroom team, with Rob Kelly expected finally to be appointed as head coach Uwe Rosler’s No 2. Leeds are also hoping to unveil West Ham’s head of recruitment Martyn Glover shortly after pulling out of a deal to bring in Norwich City scout Steve Head in this role. The Whites have also lined up a new goalkeeping coach in Cardiff City’s Richard Hartis.